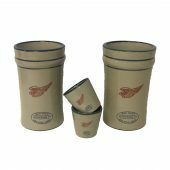 Our legacy goes back to 1877, when the first stoneware company was formed in Red Wing, at the sharpest navigable bend in the mighty Mississippi River. Our young country needed crocks, jugs, and sewerpipe, and Goodhue County had the clay deposits and an immigrant workforce to start producing millions of pieces of functional stoneware. Read more . . . 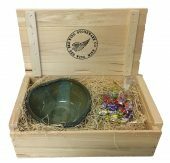 This beautifully hand thrown Heart Shaped bowl and package of candy makes a perfect gift for that special someone. Choose from our Stary Night glaze or Red Sponged decoration. The candy is multi flavored and is about 11-12 ounces. The Cocktail Gift Box set will sure to become your favorite set for making that dazzling beverage. 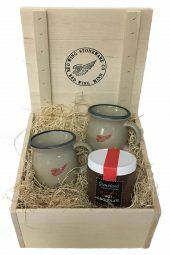 The 2 Pilsners and a Shot gift set are available in the Stary night GoodHUES Glaze and comes in our customized keepsake wooden box made in Wisconsin. The perfect gift for mocha lovers! 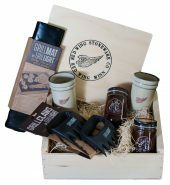 This gift box includes two of our hand crafted mugs, two of our special blend 2.5 oz Potters Blend Coffee packages and a 7 oz Groveland Confections Specialty Hot Chocolate mix. Groveland Confections is a small confectionery based in Minnetonka, MN that handcrafts all of their confections from the finest ingredients. Choose your favorite sipping mug: 10 oz Crock Mug, 12 oz Tulip Mug or 12 oz Water Cooler Mug. These items are packed in our special wooden logo boxes made in Wisconsin. Wooden Box size/shape may vary between a square logo box and a rectangular logo box. The perfect gift for hot chocolate lovers! 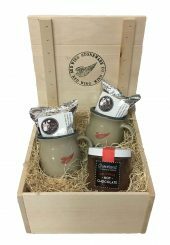 This gift box includes two of our hand crafted mugs and a 7 ounce container of Groveland Confections Specialty Hot Chocolate mix. Groveland Confections is a small confectionery based in Minnetonka MN that handcrafts all of their confections from the finest ingredients. 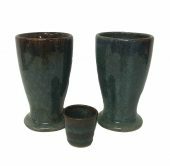 Choose your favorite sipping mug: 10 oz Crock Mug, 12 oz Tulip Mug or 12 oz Water Cooler Mug. 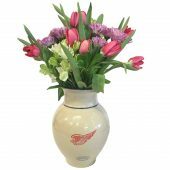 All mugs will be the Red Wing decoration. These items are then packed in special wooden logo boxes made in Wisconsin. Wooden Box size may vary between a square logo box and a rectangular logo box. Perfect for dessert lovers and those who love to bake. 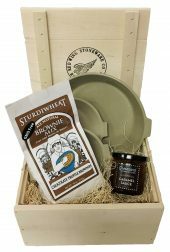 This gift box includes one stoneware 9″ Ribbed Pie Dish, one 18 oz Sturdiwheat Brownie Mix and one 7 oz Groveland Confections Caramel Bourbon Sauce. For the baker, add on two 6″ Ribbed Pie dishes for small pies and pot pies. 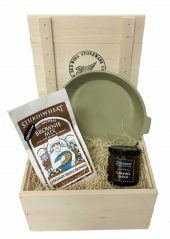 Sturdiwheat All Natural Chocolate Truffle Brownies are made in Red Wing, contain no preservatives and are GMO Free. Groveland Confections Caramel Bourbon Sauce is made in small handcrafted batches with only the finest ingredients in Minnetonka MN. All of these items are then packed into one of our logo wooden boxes made right next door in Wisconsin. 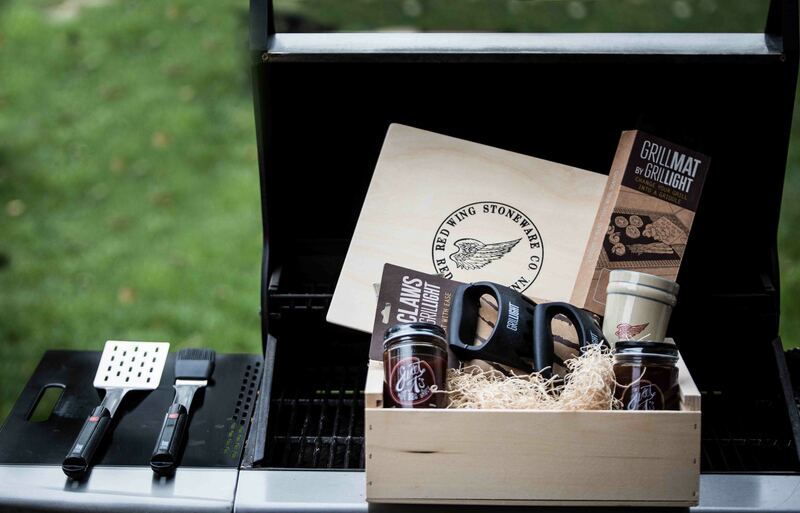 This Gift Box is sure to please all those who love to grill! We start with our logo gift box manufactured in Wisconsin. We then add 2 of our 16 oz Red Wing Stoneware Pub Pints, 1 Grillmat 2 pk set, 1 set of Grillclaws and 2 jars of Snaptail Smokers BBQ Sauce! If you want to throw some light on this package add on a set of Grillight grilling tools. Grillight tools are ingenious grilling tools with Ideal Illumination Technology in restaurant grade stainless steel frame for a stylish look and quality feel. Grillight 2 piece set includes tongs & spatula. Grillight 5 piece set includes tongs, spatula, brush, fork & apron. Dishwasher safe, microwave safe & lead free. Stops food from falling through the cracks… no more flare ups! Lift turkeys or heavy brisket with ease! Snaptail Smokers, a Minnesota small business, has won several awards with their homemade sauce. A sweet hickory smoke with just a little heat at the end. A bump and a beer gift box. 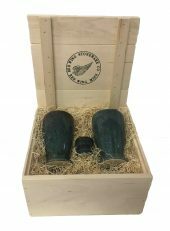 We have recently added a gift box to carry on the long tradition of putting a little zip in your beer. 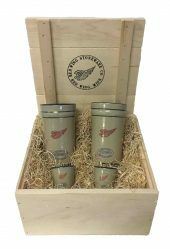 The 2 Pub Pint and 2 Shot gift set will sure become a favorite of alternating sips with your crisp cool beer. Available in blue banded in the Red Wing design. Packaged in our customized keepsake wooden box made in Wisconsin.